Hamptons is a perfume by Bond No. 9 for women and men and was released in 2005. The scent is fresh-aquatic. It is still in production. ... for me not because I refuse to use this mostly inaccurate term. But I don't want to go into more detail about definition questions in the field of aquatic fragrances and their various variations. Hamptons (for me somehow the American Sylt) has as basic idea a similar as Millésime Impérial, a maritime hot spot of the rich and beautiful in summer. At least that's what Creed's marketing sarge and the name of this bond scent say. In this series, many different locations with equally different concepts are represented olfactorially. Such a thing can of course only be an idea, a hint because everyone who knows the places personally certainly has a different scent memory. I think this series is generally well done, it has - supported by the synthetic Bond used - a very good shelf life / silage for this often volatile genre. Only Hamptons falls out of this scheme: At the first test I noticed a flowery mushiness that hasn't changed much and smelled more like a women's fragrance. Hamptons is also considered in some descriptions as a women's fragrance .. for me, however, it is - like most bonds - a unisex fragrance. At the second attempt it got better; The start with a citric freshness note can only be perceived as single for a short time, as it quickly combines with the exuberant scent (which I perceived as muffíg at the first test) of lime blossoms and jasmine. The fragrance now turns into a pleasant spicy sweetness and the magnolia is added, which with its rather fresh appearance relativizes the sweetness somewhat. In the base, amber and creamy sandalwood now support the fragrance, which becomes very close after 2-3 hours. After a brilliant start, the fragrance quickly becomes very close ... which is certainly due to the idea of the discreetly not conspicuously scented Hampton inhabitant / visitor. For me personally, the difference between a strong head/heart note and a very reduced base is a bit too crass but not really disturbing. Hamptons is - just like Sag Harbor - rather an olfactory impression, the attempt to depict a diverse landscape. This has also been successful, after repeated wearing of the fragrances and knowledge of the localities the subtleties are revealed. The flowery-spicy orientation and the decency of the fragrance after the head/heart note are basically just right. A friend said this is one of his favorite Bond's and had me try it. I was at a Sak's and what I smelled was not pleasant at all, I was sure the bottle was bad. So a week later I was in a different city in a Nordstrom and tried again. Nope.. the Saks bottle wasn't bad, that's just how this one smells to me, like a fragrance that has gone off. Perhaps the dry down is better, but I couldn't bring myself to wear it. I don't know where the notion that Bond no 9 HAMPTONS is a Creed SILVER MOUNTAIN WATER clone came from, but it seems obviously false to me. My own perception of this perfume has changed since my first review, when I maintained that it was not an aquatic floral, but a citrus aromatic, but what has never changed is my conviction that this composition could never be a SILVER MOUNTAIN WATER clone because of its conspicuous absence of "silver" or any other sort of metallic note. I do own that HAMPTONS smells closer to SILVER MOUNTAIN WATER than it does to CHANEL no 5. HAMPTONS also smells closer to SILVER MOUNTAIN WATER than it does to H20 (plain water). 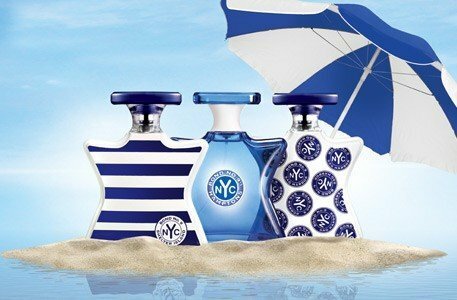 Does HAMPTONS smell closer to CHANEL no 5 or to plain water? Probably the former. But who really cares? Today I decided to put HAMPTONS to the vacation weather test. In fact, I've been attempting to reconceptualize our unseasonably hot summer by imagining myself in a variety of holiday settings where, in truth, it was much hotter and often more humid than it has been in Boston for the last couple of weeks. "Tney" say that we have only one more day of 90F+ weather (94F is the forecast for tomorrow), before a reprieve. I'll believe it when it happens. Until then, I'm on vacation, and today I went to the Hamptons. I have never actually been to the Hamptons, nor do I know anyone with a house there. But I'm sure that some of them have bottles of Bond no 9 HAMPTONS, just as some people in Texas have a bottle of TEXAS, some tourists to Las Vegas have bottles of LAS VEGAS, etc., etc.. This morning I found HAMPTONS to be a bit nondescript: only very lightly floral and with more of an emphasis on the Bond no 9 woody base than anything else. This morning I found it somewhat pleasant and clean. Before setting out for a walk in the heat to run a few errands, I reapplied HAMPTONS and found that it really was quite a bit more aquatic than I had previously recognized. Because I do not feel very comfortable in aquatic fragrances, I started to regret having made this selection for today's hot and humid weather. Once I got outside, however, I felt fine. Write the first Review for Hamptons!